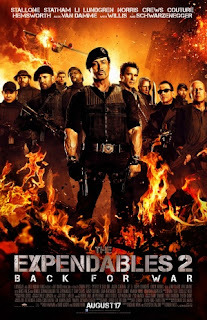 The action heroes of the heydays are back with a sequel, The Expendables 2 injected with more heart pumping action scenes & silly antics. What else can I say about the movie? The action stars from the 1st instalment reprise their roles in this sequel with a new addition to team, Billy starring Liam Hemsworth. Both Bruce Willis & Arnold Schwarzenegger had more screen time than before so you'd be sure to have loads of fighting & gun shooting scenes. In short, the Expendables team has been called upon for a mission which leads to a supposedly easy paycheck. When one of the members is murdered on the job, the team led by Barney Ross (Sylvester Stallone) is set to avenge their comrade in a deep enemy territory. Van Damme is the villain called Vilain (seriously...) is the enemy head with greed, power & devastation in his mind. Basically, the story about the good going up against the evil is nothing new so don't get your hopes high that this sequel would be any different. In fact, I felt the storytelling is rather weak compared to the 1st movie as it focuses more on ensuring all the old action heroes are shown kicking enemies' asses. It was hilarious watching how they incorporated witty & cheesy dialogues with snippets of each actor's own actual biography. Chuck Norris also made an appearance & sure did made the movie more nutty than ever.